Recém-renovado, cabana de madeira ensolarada é uma jóia escondida disponível para o aluguer de verão em uma semana ou mês. TAMBÉM DISPONÍVEL PARA ANO ACADÊMICO. Clique no vídeo para ver o passeio virtual. Caminhada curta para as praias de Bonnet, curta viagem de carro para Narragansett Beach, histórico Newport, Wickford, Wakefield e Block Island ferry. Maravilhoso para caminhar, andar de bicicleta, nadar e perto de aluguel de caiaque. Perfeito para casal ou família pequena. We just came back from a wonderful week at the Bonnet Shores house. Carol and David were wonderful. The house is perfect, spacious for a small house, the kitchen had all you needed. The front porch and outside deck were so lovely to sit on after a long day. The location is ideal, you are a 3 minute bike down to Bonnet Shores beach, and you are centrally located to other towns and beaches. Log cabins are pretty prevalent in this area - not sure why, but they are quite wonderful. Carol and David's was recently renovated and done beautifully. I would have liked some more comfy sofas/lounge chairs both inside and out but otherwise furnishings were very nice. We were a bit surprised that the adjacent houses were so close. But other than that, it was a great spot - close to beaches, Newport, and central Narragansett. Carol and David were very nice and helpful - even lent us a CD player and some of their own home-made CDs! And provided bikes that were perfect for getting to the beach. stayed with my 3 kids. owners are wonderful and really helpful! The cabin was very clean and welcoming! David and Carol met us at the cabin when we arrived. They live in the house right next door and were readily available for any needs/questions we had. The cabin was very comfortable, clean, organized and inviting. All towels, sheets and much more were included. It was very nice to have such a well equipted kitchen as well. 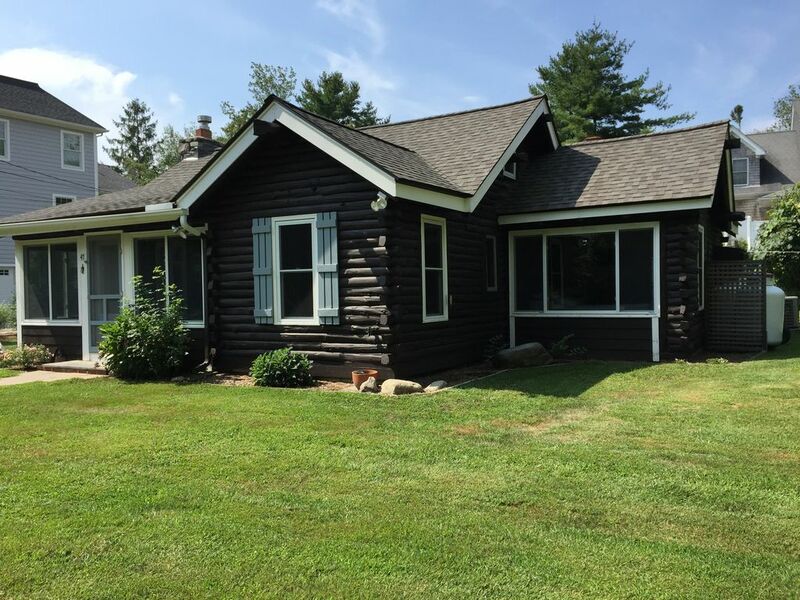 The cabin is set back in a peaceful wooded area and very close to the local, Kelly beach! We had a wonderful vacation and plan to come back again in 2020!! We can't say enough about our recent time at this cabin in Bonnet Shores! The cabin itself is full of character and has a true cozy, cottage feel. The owners keep it impeccably clean and well maintained. We enjoyed the outdoor space as well, including the outdoor shower. The fact that it is on a private road made for an exceptionally quiet experience, which is often hard to find when renting. That being said, it is only a five minute drive to Narragansett town beach and a short drive to Newport. It was so convenient having a laundry room on the premises. Dave and Carol were extremely friendly, helpful hosts. They gave us great recommendations for local restaurants and were available if needed. We have been renting in the area for several years now and are happy to say we have finally found a place we will return to again and again! I loved the property and would definitely stay here again! The peoperty is spacious, clean, and organized. It is such a cozy and private cabin, it really did feel like home! It had everything I needed during my stay with regards to appliances, furniture, utensils. The few minute walk to the beach is a plus. David and Carol are great hosts, they give you your space but at the same time they are always available for any questions you have or help you might need. Their response time is great, they really care for their guests, and they give you awesome suggestions of restaurants to visit or activities to do while at Narragansett if you are new to the area. Lovely cabin, would definitely rent from them again!